Works comprised the full decommissioning, asbestos abatement, demolition and dismantling of a former Lithene and Latex production facility within a live top tier Comah site. The site consisted of tanks, production buildings, warehousing and storage, a lagoon, loading gantries, pilot plant, substations and switchrooms and a utilites building compelte with water treatment plant, boilers and stack. The site was mothballed in 2007 with a view to returning to production following a downturn in the Latex Market. Unfortunately the plant never returned to production and was presented for tender by the client in an idled state. Initially an inspection was made of the plant to determine the value of the asset to be disposed of for both scrap and where possible re-use into alternative markets. The high residual value of the Nickel based alloys, Copper and Non Ferrous scrap was integral to the success of the tender with the availble value that could be returned to the client post recovery. A programme was also developed during the inspection period and rescourced accordingly to develop a tender sum allowing for residual scrap value to be offset against costs. During the tender period demolition / refurbishment surveys were completed identifying significant quantities of asbestos insulating product in the main production facility. Asbestos cement products were also present throughout. Costs associated with the abatement were included in a second round of pricing. A decomminissiong programme was also developed to assist in the removal of hazardous and residual products retained within the facility. Following award, works commenced with the asbestos abatement being undertaken in the main facility and the demolition commencing on the external plant and equipment. Working in conjunction with our client, as residual products were encountered, these were removed by Robinson & Birdsell and placed into sealed skips for disposal with due cognisance being afforded to any health, safety, environmental and conventional risks likely to be encoutered with appropriate project documentation being in place. 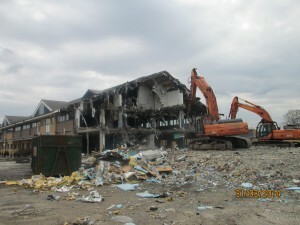 Working progressively through the external plant and equipment areas the main building was cleared on all elevations in preparation for demolition. Following asbestos abatement the works commenced on the main plant clearing the three storey section of the main production facility using conventional demolition techniques. To ensure access for our high reach all material generated during the low level works were segregated, processed and disposed of in the approriate waste streams. The high reach was the utilitsed to demolish the remainder of the building with support from standard reach demolition spec excavators. Peripheral works were ongoing during the main facility demolition including abatement of asbestos cement sheeting throughout the site, processing of heavier plant items such as the boilers utilising hot cutting techniques and the deplant and removal of equipment from the pilot plant which was housed in a building to be retained. All brick and concrete arisgins resulting from the demolition were also stockpiled and crushed on site for backfill, grading and levelling, and future site development. During the course of the demolition assets identified at tender stage for reuse were also recovered and placed in a laydown area for collection. Additional items of plant and equipment were also recovered beyond those originally selected with an uplift being passed back to our client. As part of our scope a fire water lagoon was to be de-watered, de-lined and backfilled with site won crushed material. An ecological survey was commissioned by Robinson & Birdsell which identified a newt population for re-location. Working in conjunction with our environmental consultants, trapping and netting was undertaken at various times during the project resulting in the relocation of 100 plus newts to an adjacent approprite approved watercourse. To assist in potential future development of the site various bases, upstands and support plinths were broken out with any variations in site level being battered back using site won crushed material. On completion of all main site demolition works the remaining utilities stack required dismantling. 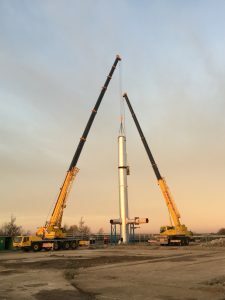 Utilising a 200 tonne lifting crane and a 60 tonne man riding crane the stack was dismantled in house to a safe height over a period of three days. Following demobilisation of the cranes the remainder of the stack was felled under controlled conditions within the footprint of the former utilites building. All works were completed safely, on time and to budget. 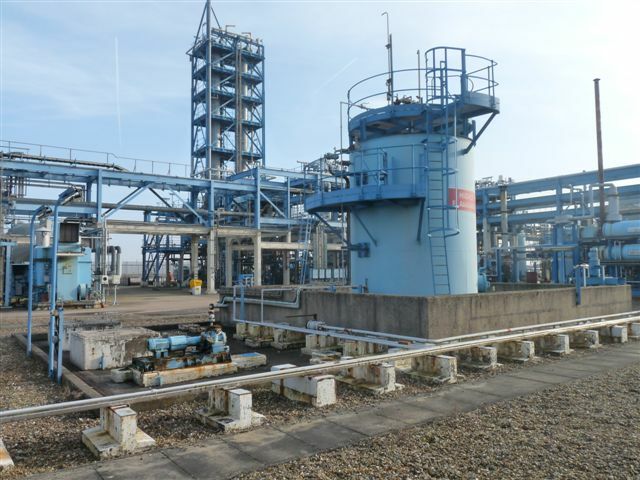 This project required the safe and controlled demolition of the old administration building and locker room building at Phillips66 Immingham Refinery. Before commencement of demolition a soft strip of both buildings was required plus the removal of all Asbestos Containing Materials (A.C.M’s). Robinson & Birdsell Ltd erected a two lift working scaffold platform around the circumference of the old administration building to assist with the removal of asbestos cement sheets which formed part of the outer skin of the building structure. The platform itself was then encased with thousand gauge poly-sheeting. Full asbestos control measures were in place during this removal. On completion of asbestos sheet removal, the scaffold platforms were de-erected and removed from site. Soft strip of the building commenced with the vast amount of general waste. After these tasks were completed, the floor tiles were uplifted and disposed of through the correct waste stream. Steel plates were laid over manholes and cable ducts and demolition was allowed to proceed. Working in a north to south direction, a Doosan 480 excavator with 360° pulveriser attachment proceeded to demolish the concrete and steel two storey building. All arisings were placed into separate waste streams and were then processed by a Daewoo 340 with 360° multi-processor with shear and pulveriser attachments. The floor slab was uplifted and pulverised; all arisings were recycled, including the timber from within the building structure. Minor asbestos removal within this building was completed within one day. After this, all ceiling tiles were taken down, placed into clear poly-bags and disposed of in waste skips. All other general waste materials were then collected from inside the lockers and areas within the building and placed into waste skips. The steel lockers were left ‘in-situ’ and removed during the demolition of this low level building. Protection steel plates were again placed over manholes and cable ducts, plus an area to the north of the building where the excavator stood, to start the demolition. Apart from the lockers, the structure consisted of concrete bison beams and brick. Again, the excavator pulverised the concrete and removed the rebar for recycling, along with the rest of the arisings. The floor slab was also lifted and pulverised. The footprint of the building was then in-filled with pulverised concrete and brick and levelled off to client specification. The project was completed with no environmental incidents and to the total satisfaction of our client. This involved the demolition of H-0701 Sales Gas heater, pumps, pipework, stands and platforms, fireproofing and ancillaries and disconnection of static earth bonding once heater had been removed. Scaffold was erected to protect live services, pipe rack and instrumentation panels. The purpose built working scaffold provided safe access/egress for dismantling personnel to carry out their workload activities and gave safe working platforms for the dismantling workforce. During the heater dismantling and the ongoing scaffold removal a mobile elevation working platform (MEWP) was used, as and when required, as a safe means of access for demolition operatives to carry out their workload. In addition, all original lifting eyes on the heater component sections were re-tested for reuse during our removal programme. Removal of the sales gas heater H0701 component sections was carried out in a systematic sequence working top down, with no hot-works as the team were working on a live gas site. Structural investigation of existing facility and structure design to enable the works to be carried out. Removal and disposal, where required, of all asbestos containing materials, mercury contaminates, and other hazardous materials including, but not limited to, MMMF, and bird excrement/carcasses. Soft stripping of all levels of individual demolition packages to include; electrical equipment, lighting units etc. for disposal off site. Protection of existing services, draw pits, drains, structures, buildings, plant, equipment, roads and footpaths. Demolition of identified individual demolition package down to surrounding ground floor slab level, excluding plinths. All studs and holding down bolts taken down to grade level. Provision of digital pre and post demolition photographs for inclusion in Health and Safety file. 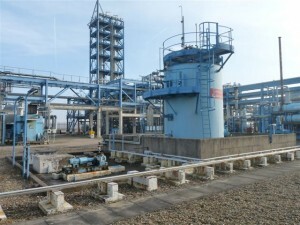 The Easington Terminal is a live operational plant with natural gas and methanol processing units. Additionally, there is a large pipe rack with several live mechanical and electrical services directly to the east and south of both areas. Underground services run through all areas of the Easington Terminal. 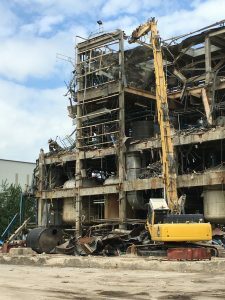 Robinson & Birdsell Ltd had to select and plan their demolition and deplant activities to ensure live operational units were not interrupted. 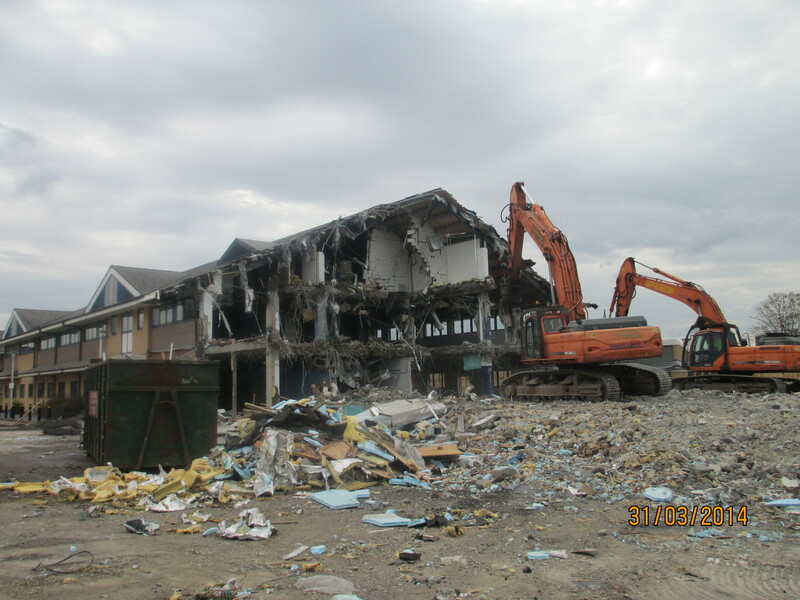 Robinson & Birdsell Ltd also had to plan their demolition activities to ensure that any adjoining facilities and land owned by a third party remained undamaged and fit for purpose as agreed with the Construction Manager. Due to the proximity of works to the Terminal access roads, Robinson & Birdsell Ltd planned their demolition vehicular and lifting activities to avoid blocking of primary routes. This project was completed safely, with no environmental incidents and to the total satisfaction of our client.